Netflix has released a teaser image for its upcoming series based on Dark Horse Comics’ The Umbrella Academy. 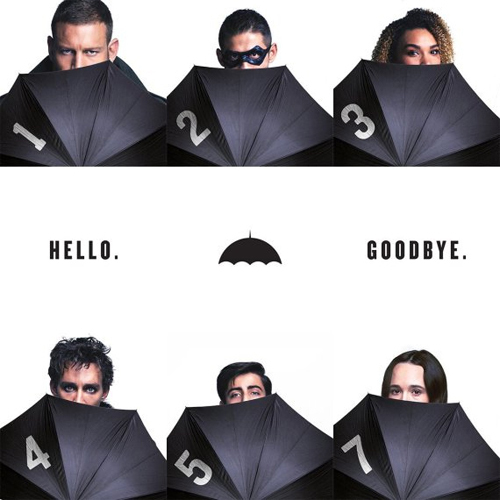 The cast of the 10-episode series includes (clockwise from top left) Tom Hopper as Luther Hargreeves/Spaceboy, David Castañeda as Diego Hargreeves/The Kraken, Emmy Raver-Lampman as Allison Hargreeves/The Rumor, Ellen Page as Vanya Hargreeves/The White Violin, Aidan Gallagher as Number Five/The Boy and Robert Sheehan as Klaus Hargreeves/The Séance. Colm Feore will play Sir Reginald Hargreeves/The Monocle, Kate Walsh will play The Handler and Mary J. Blige will play hitwoman Cha-Cha.